Hampton VA (7-14-18) With the speedways most prestigious event on deck, The Hampton Heat 200. 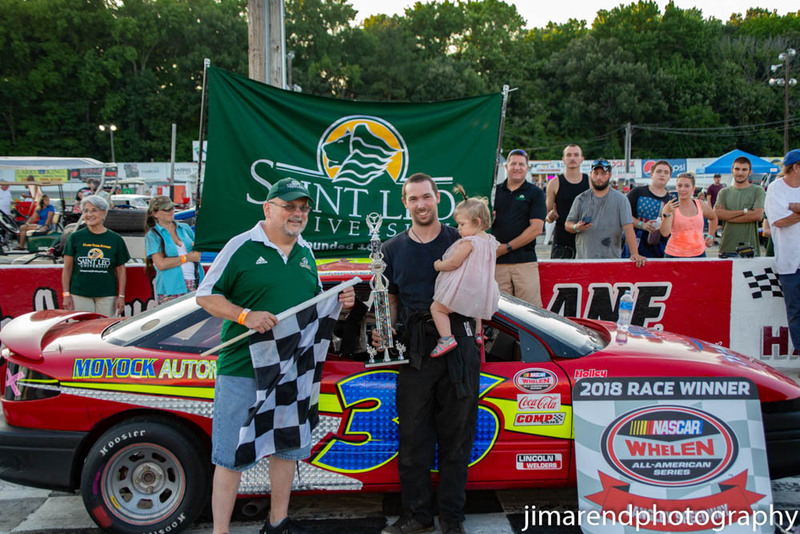 The race action for this week was not to be ignored and making their debut appearance at the speedway were The Southern Ground Pounders race series. The vintage style type race cars feature decent horsepower with wide tires in contact with the track making stops throughout the Virginia and North Carolina to compete. Also making for a great night at Larry King Law’s Langley Speedway were the ERA Realtor Winged Champ Karts, Carroll’s Automotive U-Cars and the Riverside Paper Pro Six’s. The race card also featured the Old Skool Video Games Super Streets and Larry King Law Modifieds. Here’s a recap of the evenings exciting race action. ERA Realtor Winged Champ Karts 20 Laps: Garry Osbourne was back on pole in Winged Champ Kart series qualifying. His fast lap at 22.525 seconds was nearly a half of a tenth better than the lap of Aaron Leach in a share of the front row. Tillman Heuer, Chris Bechtel and Danny Millard were the five best in Winged Champ Kart qualifying. Green flag was given to the twelve car grid and the earlier leader would be the pole sitter Garry Osbourne. Tillman Heuer caught a break to tuck back in with the leader to begin their assault over the others in the grid. The next two car tandem consisted Aaron Leach and Danny Millard who just before the halfway was struggling to catch the leaders. Latter laps in the feature saw Danny Millard get shuffled back and even losing the draft. Back up front, the race for the win got real interesting, when on the final lap of the feature. Tillman Heuer went to the high side, drew even with the leader Osbourne and at the stripe it was Garry Osbourne the race winner. Garry Osbourne from Victory Lane, “Gotta give hats off to Tillman Heuer for driving me clean”, shared the race winner. “I actually had to look at the scoreboard because I thought he was in front of me. It’s a lot of maintenance, it’s a lot of learning curve, I remember when I raced two laps down, it’s great to be up front”. 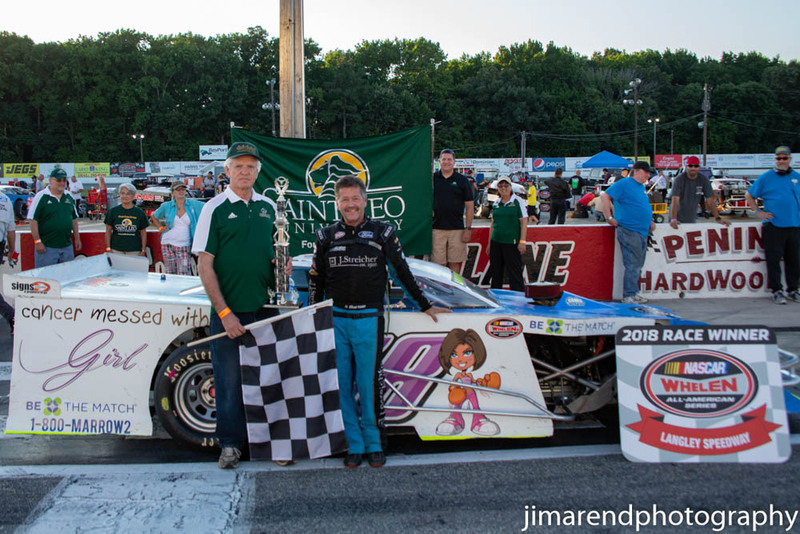 Larry King Law Modifieds Twin 30 Laps: Shawn Balluzzo spoiled outside row one starter Matt Carter’s chances at a modified series pole. Balluzzo’s pole lap was set at 16.425 seconds which he’ll get to show the field to the green. Bubba Johnston, Danny Harrell and Bobby Gery were also quick in the series qualifying. The green flag waved and the roar of engines took to the air with pole sitter Shawn Balluzzo showing the way. Matt Carter was up to the task of leading when he was able to sneak underneath of Balluzzo for the lead. Still early in the feature, Balluzzo was all over Carter in search of a way around. Andrew Fortin was on it hard making his way to the third position and one of the faster cars on the track. Just before the halfway, Carter left the bottom open and Balluzzo filled it in and completed the pass for the race lead. Making his way into the top five would be DJ Valente in a strong run but back up front, Shawn Balluzzo had opened up a ten car race lead. 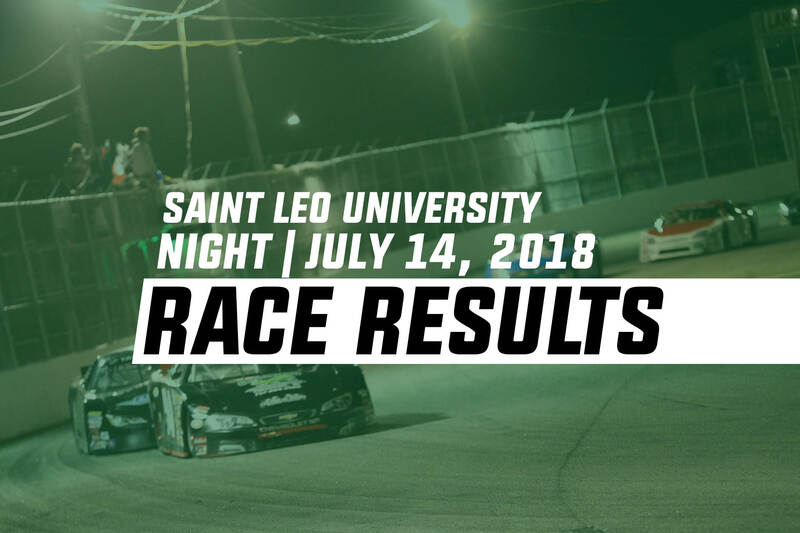 Latter portions of the race saw Matt Carter unable to close as the race would go caution free with Shawn Balluzzo taking the win. Balluzzo from Victory Lane, “First, I want to say, this one is for Bryce”, the exhausted race winner said. “Just want to thank all the fans, friends, everyone who has given the support all these years. My crew did all the work today, I was not here at all, they did all the work so I really appreciate that”. 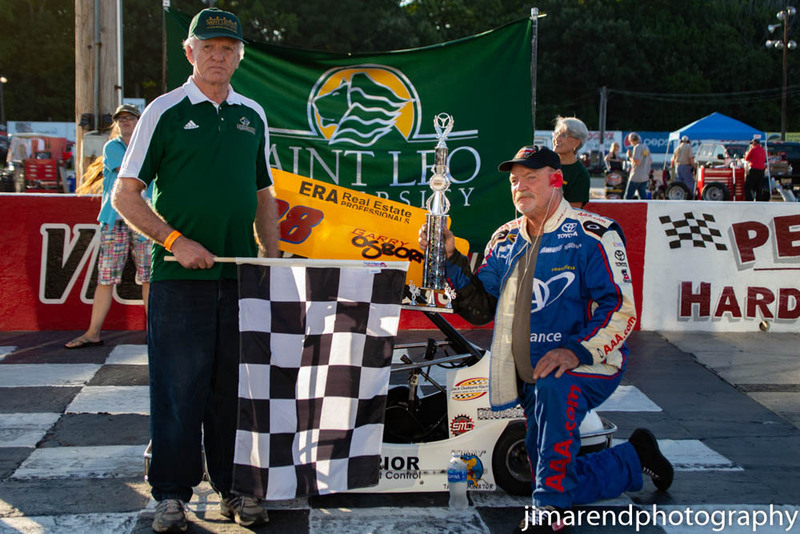 By virtue of NASCARs eight car invert rule, Bobby Gery would get to start the second feature on the pole forcing the race winner Balluzzo to start eighth. With division one national points on the line, Balluzzo elected to start at the tail end of the grid for max points. Green flag waved and Bobby Gery showed the field into turn one. But out of two it was Bubba Johnston emerging as the leader. Andrew Fortin, DJ Valente were some of the early movers to the feature in second and third. For Balluzzo, the early laps were not so kind as battles for position held the race one winner at bay. Back up front and just before the halfway, Johnston continued to lead showing a half a straightaway length lead. Several laps later, Shawn Balluzzo was seen picking off the competition one by one who was showing third with just a handful of laps remaining. After doing away with Fortin for second, with just four laps left to get by race leader Bubba Johnston, the lead was dwindling. But for Balluzzo, the laps ran out and Bubba Johnston wins in Modified race action. Bubba Johnston in Victory Lane, “It’s been a long time since we earned one”, claimed the race winner. “We won a couple of races last year but we weren’t the fastest car, Shawn has been the elite of the division here. All I do is show up here and drive the car, these guys work on the car all week long. They bring it here, let me get in it and drive the car”. Carroll’s Automotive UCAR 20 Laps: Colby Vance picked up the UCar series pole posting up an 18.899 second lap. Michael Waters would get the shotgun starting spot just twenty nine thousandths off the pole time and clearly deserving of the spot. Austin Davis, Tillman Heuer and Richard Ellis completed the five fastest in UCar qualifying. Green flag dropped over the grid and into turn one did the field go. Out of turn two with the race lead would be the outside row one starter Michael Waters. Quickly did the leaders establish a sizable lead over the rest of the field but back up front, pole sitter Colby Vance would not let the leader get away. Still early in the race, Richard Ellis would advance one spot to fourth in chasing down third place runner Austin Davis. While those positions were secure, race leader Michael Waters by the halfway started to put some distance in between himself and Colby Vance. But for Vance, he would not get another opportunity as Michael Waters dominated the UCar race event. Waters in Victory Lane, “No not really, Colby tried to get a good rolling start and I just took it into one all I could, held on to it and Dean came over the radio and said I was clear”. Riverside Paper Pro Six 30 Laps: Adam Florian was back on the pole in this week’s Pro Six series action. The pole time was set at 17.110 seconds with Travis Wall claiming the two spot on the grid in a series that has closed greatly on the dominance of Adam Florian. Green flag was in the air and the chase after pole sitter Adam Florian was on. Early laps saw Travis Wall at the bumper of the leader with JB Sipe only a few car lengths back in third. Several laps later, the leader Florian had mounted a three car length lead over Wall who by all means were both the class of the field. At the halfway, Travis Wall continued to find ways to cut into Adam Florian’s race lead but at this point to no avail. In the late laps of the event, race traffic became a factor for the leader as Travis Wall would knock off a bit of the lead but the laps would run out as Adam Florian wins in Pro Six action. Florian from Victory Lane, “The car was real tight the first five laps, once the air pressure built up she really started to hook up but then it started getting free towards the end. Travis looked real stout today, all the fans coming out tonight, thank you all and appreciate your support as always”. Old Skool Video Games Super Street 40 Laps: Landon Abbott picked up the Super Street pole award by sporting a lap at 18.733 seconds. 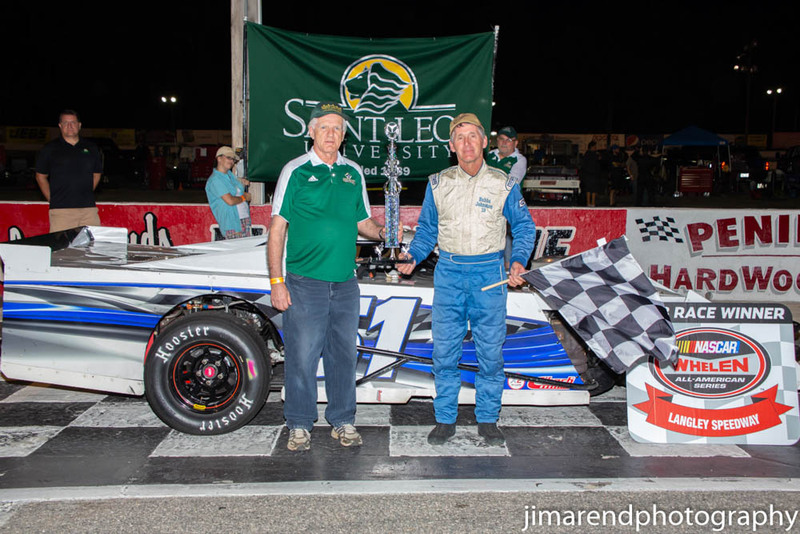 Dale Parro was fast as well earning a share of the front row followed by Randy Akers, Sean Calway and Jason Michaud as the Super Street five fastest. Green flag was displayed to the twelve car grid and emerging as the race leader would be the pole sitter Landon Abbott. After an early race caution, racing resumed with Abbott continuing to lead. Randy Akers would have a great start to his race in chase of the leader, Jimmy Adkins was also on the move going from ninth to fifth in the early laps of the feature. Laps later, Dale Parro would get by Akers for second but for the race leader, Abbott had a near half a straightaway lead. At the halfway, Bill Eaker Jr would work his way into the top five but for second place Dale Parro, cutting into the leader’s lead was a bit of an issue. Laps later, race traffic became a matter for the race leader as Parro was collapsing in on the lead. In desperate need of a caution, Dale Parro would pick off a car length with the passing of each lap car but the laps would run out. Landon Abbott wins in Super Street competition, Abbott from Victory Lane. “Yeah, I was just trying to hang on, we had a really great car”, explained the race winner. “I think they need to teach this lap traffic how to get out of the way that was pretty ridiculous. I wouldn’t race people like that when I’m a lap down, just need some racers courtesy. You know, we put a lot of work into this, we don’t run every race but when we do it’s good to come out here and win like this”. Hampton, VA (7-16-18) Post race tech for the Super Street race division concluded earlier this afternoon which resulted in two disqualifications. Race winner Landon Abbott was disqualified for parts not conforming to the rules and runner up finisher Dale Parro was also disqualified for failure to comply in tear down. 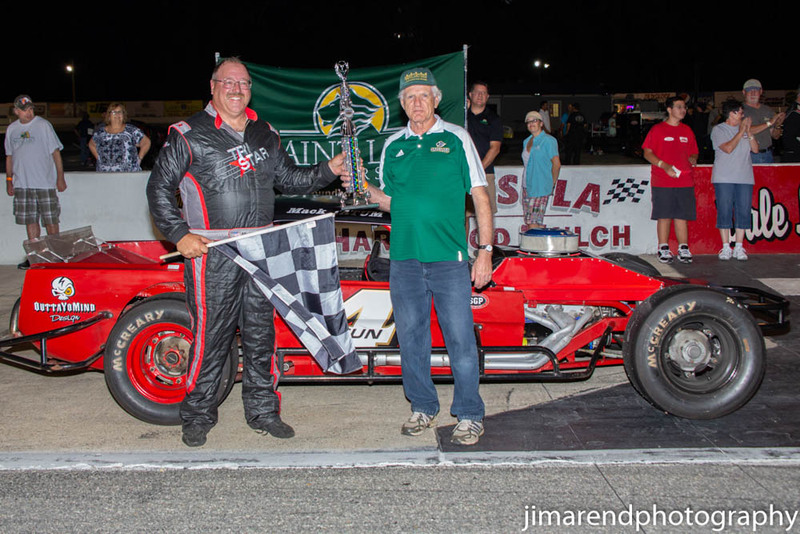 As a result of the DQ’s, third place race finisher Randy Akers was awarded the win. 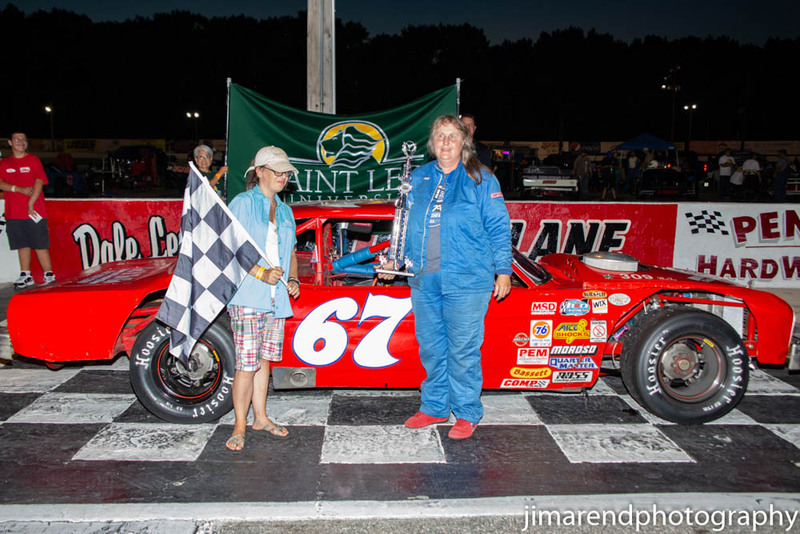 Updated race results are down below as Larry King Law’s Langley Speedway and the City of Hampton Virginia looks forward to hosting next week’s Hampton Heat 200 Late Model race event. Ten thousand dollars to the race winner and also the second leg of a three race series called The Virginia Triple Crown. Event schedule to be distributed in the coming days, please visit our website langley-speedway.com for more information. 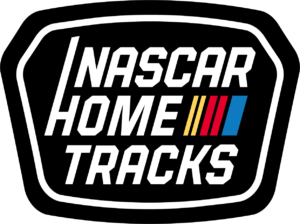 Driver interview requests please call the track directly at 757-865-RACE. Southern Ground Pounders 25 Laps: Based on a pill draw, Bubba Farmer would get the series pole with Jerry Jeffries starting second in the front row. The feature combined both Modified and Sportsmen divisions in the Southern Ground Pounder race feature. Green flag would wave in the air and the pole sitter Bubba Farmer had the early race lead. But two laps later from the seventh starting spot, Susan Kimel would blister through the field and take the race lead. Also, on the move as the halfway neared would be Barry Daulton who showed second along with Dwight Sauls in third. With the halfway now in the books, the race experienced its first caution which gathered up the race field for its first restart. With the green back in the air, Kimel quickly had an eight car length lead over Dwight Sauls in second. Mack Tatum would make his presence known showing third and on the move. But back up front, the straight six powered Falcon Susan Kimel was having her way. 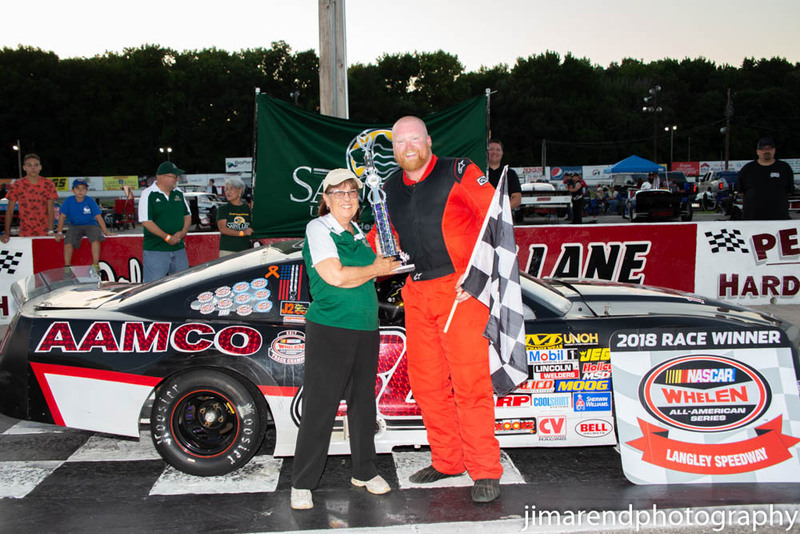 Final laps saw the best battle going on the track was for second but when the final lap completed, Susan Kimel crossed the stripe first in the Southern Ground Pounder Sportsmen division, Mack Tatum by his finish won the Modified division race. Kimel from Victory Lane. “This is a six cylinder, I think that I could get around here better because I have less horsepower than they do. I guess they can’t get off the turn but it was a good race, I made a good move at the beginning and I went where there was no race track and it worked, it was a good race”.